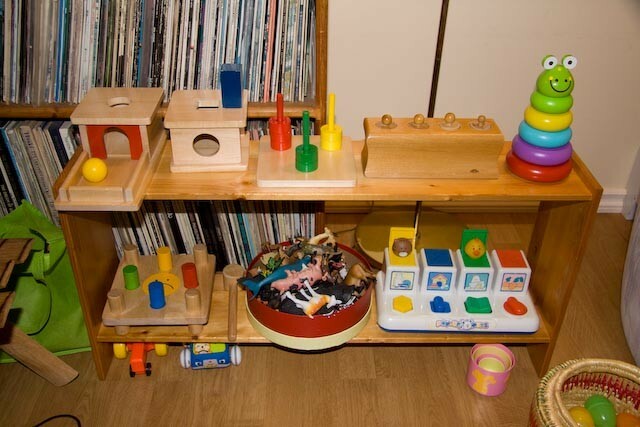 The Montessori Child at Home: A new house and a new bedroom for S.
This past year has been one full of changes for S. Many of you will remember S. as the child who inspired me to begin this blog. His mother is a teacher at our school and is, at this very moment, waiting at home for the birth of her (very overdue) second child. S. and his parents recently bought (and are renovating) a new home. 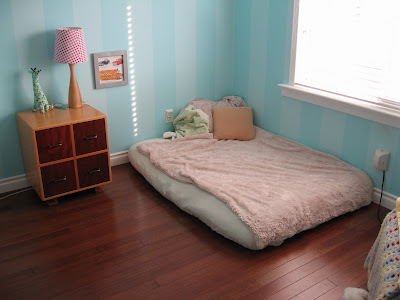 Here are some pictures of S.' s new bedroom. The low Montessori-style bed and the set of drawers are the same as in the previous photos of S.'s room. He can now open the drawers and select his own clothes. As K. (Mum) mentioned, she puts only a couple of choices in each drawer in order not to overwhelm S. while giving him the freedom and independence of deciding which clothes he'd like to wear. I also love how low the window is. S. can easily look outside any time he wishes. 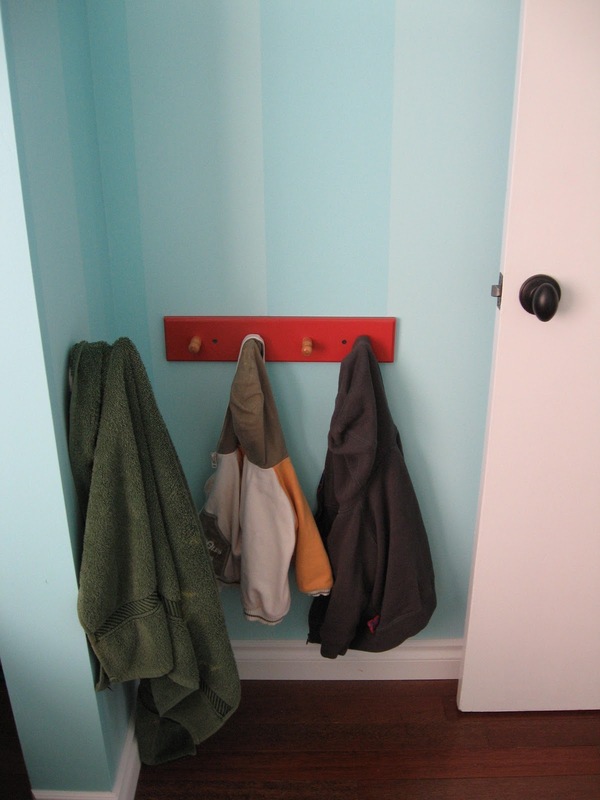 His belongings are set out on a shelf where he has easy access to them. (It should be noted that these pictures were taken just after the room was put together. The cord to the CD player has since been secured to the back of the shelf unit.) A couple of cheerful pictures have been hung at S.'s eye level and the space is not overly decorated or accessorized. In addition to the set of drawers in the room, there are hooks on one of the walls to facilitate S. hanging up his towel, jacket, etc. Notice how low the hooks are. S. has no trouble reaching them at all. And finally, here is a picture of S. and his baby doll. A lovely way to help prepare a child for a new brother or sister. This is a sweet room. Thank you for sharing. I love seeing how other people set up their homes for their children, I get a new idea every time. Have you any students/families who have siblings in the same room? I am interested to know if you have seen this work. So lovely! 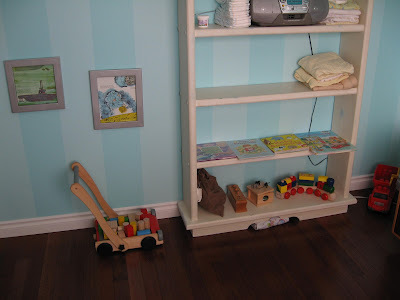 We are moving soon & I am bookmarking this as inspiration for my 18 month old's room! I am a parent of a child in a Montessori school. I am making a short video to help teach parents how to bring Montessori into their home. I was wondering if I could use some of your photographs. There will be a credit that lists your blog so that parents can come read more. This video will be shown at school one evening to the parents and then also sent in a newsletter, again only to the parents. Let me know if you are interested in sharing these photographs. Your blog is wonderful. Thank you!